Indianapolis — For people who visit art museums to feast on Rembrandts and van Goghs, Whistlers and O'Keeffes, Picassos and Pollocks, a design exhibit isn't much of a lure. What is "design" anyway? It includes typewriters, watering cans, chairs, lamps, dishes and even detergent bottles -- often mass-produced, generally lacking that elusive emotional element expected of art. What's artsy about them? And how can one decide which, if any, of these everyday objects are museum-quality? If you're at all interested in the answers, "European Design Since 1985: Shaping the New Century" -- a massive show of some 250 works -- is for you. In it, R. Craig Miller, the curator, sets out not only to anoint Europe's best designers but also to organize them into movements. And, because he believes design in the U.S. lags behind Europe's, Mr. Miller wants the show to catalyze more innovative design here. Displayed in a loosely chronological way, the show assigns objects to the major aesthetic and conceptual ideas that have reigned in Europe and thus influenced design around the world. There are eight categories, starting with "Decorative" and ending in "Neo-decorative," each with its own gallery. The eight, in turn, are grouped as Modernist, Postmodernist, and Modernist again. This is a scholarly show. It helps to read the catalog. Still, Mr. Miller says he believes shows should be like onions, with layers -- working for 12-year-old visitors and all the way up to serious scholars. What would a casual viewer (maybe older than 12) see? Mr. Miller set out his goal in the catalog's introduction: "objects . . . judged not only by conceptual, technological, or functional criteria but also by whether the designer consciously sought to impart some poetic or aesthetic aspect to his or her work." On that score, there are standouts in each section. A star of the first (Decorative) is Sylvain Duboisson's 1989 desk (above left), a haiku in ivory leather and parchment, perhaps followed by the many neo-baroque items, from candelabra to chairs, by Czech designer Borek Sipek. 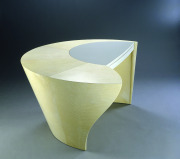 Next, in the Expressive gallery, architect Zaha Hadid offers a beautifully sculpted sofa and silver set. Mathias Bengtsson uses computers to spin out a swirly chair assembled by layering thin, varying aluminum shapes and a see-through, carbon-fiber chaise longue. But they are outshined by Ron Arad, an Israeli who lives in Britain. Mr. Arad, here a master of silvery tables (especially "Three Thirds of a Table") and chairs, shows up again in other movements -- exhibiting a range and vision that easily place him as a leader of contemporary design. Crammed with items, many in vitrines that display contrasting examples of luxury and mass-produced goods, the show's Minimalist gallery felt like an IKEA store. IKEA stocks some objects on display in this show, and they're lovely. But despite their elegant simplicity, the minimalist pieces just didn't hold my interest -- the exceptions being a curvy Jasper Morrison sofa, Antonio Citterio's classic furniture, and Constantin Grcic's geometric side chairs. I suspect it's because minimalist design has been so successful that it's commonplace. The gallery certainly makes the case for its importance -- and its acceptance. Biomorphism is next -- an engaging selection. Mr. Arad appears again, with marvelous chairs -- especially "Oh Void 2 Lounge Chair" (right), a carbon-fiber affair that links two ovoids. Marc Newson even manages to make a dish rack look good, not to mention chairs and tables. Then comes Neo-Pop, which put energy, color and fun back into design. It's here that you find colorful striped detergent bottles made of Venetian glass by Maria Grazia Rosin. Objects in most of the rest of the show -- the Conceptual and Neo-Dada/Surreal sections -- seem self-consciously arty to me. These designers were striving to use humor and elements of high art. Functionality bowed to concept, and the result was sometimes witty, sometimes strange. To wit: "Lumiere," an aluminum sofa with a tongue-like flame emanating from the seat, by Denis Santachiara. Likewise, there's a Neo-Dada bench in the form of a whippet by Radi Designers and a wooden head knife block by Maarten Baas. Yikes! Finally, there is the Neo-Decorative section, a reaction against minimalism. Philippe Starck, who's been there at nearly every turn, reinvents his work: He draws on historical forms with his Louis Ghost Chair -- a clear plastic armchair with great classical lines. But there's a new generation, too, best exemplified by Tord Boontje, who puts colorful floral designs to good use in chandeliers, chairs, glasses, porcelain and ceramics. Some of this is eye candy, even kitschy. This show, nothing if not ambitious, arrives at a good time. Demand for contemporary design has soared. Now, while prices have fallen, the appetite remains. Mr. Miller says that more museums are interested, too, an impulse not entirely unrelated to the high prices for paintings and sculpture. The Indianapolis museum aspires to be at the forefront of this trend. Director Maxwell L. Anderson hired Mr. Miller in the fall of 2007, precisely to make IMA an international leader in design. Mr. Miller aims to acquire some 200 objects from this show alone; they'll go into enlarged permanent galleries for design. This is a survey show, Mr. Miller's third, following a show on Italian design and one on U.S. design. By definition, it covers a lot of territory, showcasing 118 designers working in 14 countries. But within that framework, this tour d'horizon is a tour de force.